SunlitGreen Photo Manager Portable is the smartest way to manage and administer photographs stored on your PC. This program is responsible for finding and arranging any type of image. If you would like, you can also assign a unique name and a particular category. SunlitGreen Photo Manager Portable is ideal for making albums so that you can easily share them through the Web. Just enter the application’s interface and select the photos you feel like grouping. 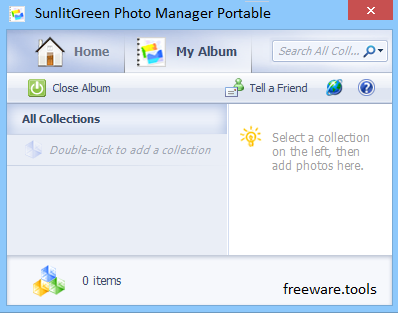 You don’t need to install SunlitGreen Photo Manager Portable to use the application. One of the outstanding features of this program is that you can carry it on a USB drive or transfer it to any computer. SunlitGreen Photo Manager Portable is a simple application with an intuitive interface, which makes photo management easy for any user. The program allows you to organize a multitude of images into collections and add various tags for simple identification. SunlitGreen Photo Manager Portable can come in handy in case you have a large collection of images that you need to catalog in a quick and simple manner. An album can contain a multitude of collections, which can be used similarly to folders on your PC. The side panel displays the collections contained in each album and allows you to open each of them with a simple mouse click. The number displayed next to each collection indicates the number of photos contained in each folder. Pictures can be added manually, from their host folders on the local drive. SunlitGreen Photo Manager Portable allows you to open the photos using the integrated picture viewer. Moreover, you can preview them, as thumbnails, in the dedicated panel, on the right side of the window, along with its tags. The tags are pieces of information that you can manually add to each photo and view within this program. They can help you find the pictures with ease, but they are not saved to the file when you close the album. You can create tag categories, applied to each item in the collection as well as custom data. Adding or removing collections in SunlitGreen Photo Manager Portable is as simple as making a mouse click. The ease with which you can add new collections and organize them is one of the significant features of the program. Another such element is the picture tagging system, which allows you to find a picture by any criteria. Moreover, the program’s portable nature allows you to run it from any drive.